Click a trail system for detailed information. CAMBr is a registered 501(c)3 organization, which means we are eligible for most of the matching funds or employee directed donation programs from many companies. So please keep us in mind when you are filling in the box for philanthropic foundations. If you need any additional CAMBr information for your company, please let us know and we will happily provide it. 100% of your donation goes directly to helping us build a better ride. are built and maintained by volunteers, riders just like you. and you do get a free lunch and a chance to ride with the people you just met, after lunch. All you need is a pair of boots, long pants, gloves and water, CAMBr supplies the rest. Check out the Calendar to see everything happening this month. Please, let's all keep in mind our trail systems are not a MTB only trail systems. They are multi-use trail systems. Which means there are hikers, equestrians and runners just to name a few, sharing the same trails. unpredictable or easily spooked by cyclists. one foot down, and lean away from the trail. human, and not a predator. the go-ahead. Sudden movements can spook a horse. Wanted to pass on this awesome trifold the Bolder club put together. 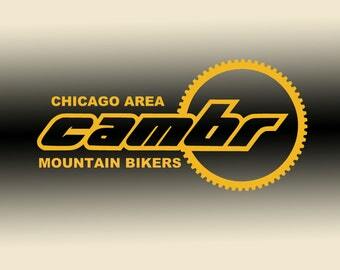 You asked for them and now we have them, CAMBr die cut stickers and magnets. so you can represent your local club and trails.